Registration deadlines are fast approaching for the Schuylkill County Fair. July 15th is the pre-registration cutoff date for general exhibits. This deadline is for exhibitors interested in registering items for general exhibits. General exhibits consist of items like eggs, fruit, vegetables, flowers, and grains. This same deadline is used for items like cakes, pickles, wine, honey, quilts, photos, and woodworking. These types of items may be pre-registered on the Schuylkill County General Entry Form. This form may be found in the premium tabloid or found on line at www.schuylkillfair.com/exhibits/. The general entry form is found at this site more towards the end of the PDF. Questions about entering general exhibits into the fair may be addressed at (570)527-0294 schuylkillfair@gmail.com. So you are wondering what this registration deadline, premium tabloid, exhibits and exhibitors is all about because you have never exhibited in the fair. A premium tabloid is a book where all the class are listed under departments. So you say what are class and departments? Classes are a listing of things by category that may be entered in the fair. So say that you have a really great photo of the landscape of some part of Schuylkill County and would like to enter it into the fair to be judged for its quality and to be seen by others. So you open up the premium book on line at www.schuylkillfair.com/exhibits/ and find Dept. 19 which is Arts and Crafts and start looking down the list of classes. Stop when you find 19/1/13 if it is a black and white photo of a landscape or look further to 19/1/22 for a color landscape. Place those numbers on the general entry form that you have printed from the premium tabloid on line found near the end of the PDF file. Mail the entry form into the address on the form and bring your landscape photo to the fairgrounds on Saturday, July 28th between the hours of 11AM and 3 PM. There is a very large variety of class in the premium tabloid for almost anything that can be made, grown, raised or collected. There are listing of classes for fruit, vegetable, flowers, needle crafts, food, wine, grain and arts and crafts to tractor. There is sure to be a class for your interest. So take a look at the premium tabloid on line for your area of interest. Your area of interest that you have is more than likely having been made, grown, or collected are called Exhibits. Exhibits are the item of interest that you want to enter into the Fair and that makes you an exhibitor. The deadline is a time line that you want to get your list of items that you want to enter in the fair so that information may be readied for you when you arrive with your items to the fair for exhibit on July 28th. 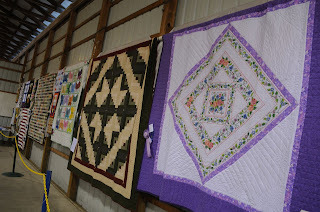 Not to say that you can’t just bring them to the fairgrounds on Saturday, July 28th between the hours of 11AM and 3 PM for judging and display, but this process is less streamlined for the exhibitor.